Ranganathan Street is a shopper's paradise for people belonging to all ages. Right from tiny tots, school goers, teens and the elderly Ranganathan Street has a lot to allure every visitor- Definitely, not a place for the touch-me-not types. 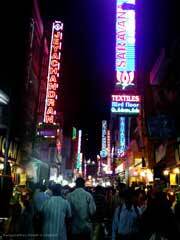 The stretch from North Usman to Ranganathan Street is jam packed with retail outlets as well as pavement shops. Interesting food to feast, juices to quench thirst, sweet shops for the sugar hungry are part of the array of shops in Ranganathan Street. The place is every crowded at all times during the year. The crowd surges to extraordinary numbers during festival seasons. The proximity to T. Nagar bus terminal as well as Mambalam railway station has made Ranganathan Street a preferred shopping area. Finding parking space for private vehicles can be dreadful and tiring. Petty crimes are common on Ranganathan Street. Jaywalk is not recommended and it helps to be on guard to ensure a fun-filled, satisfying shopping experience. Some of the well-known outlets on Ranganathan Street include Textile India, Saravana Stores, Jeyachandran Textiles and many more. Pick up household articles, music, CDs, accessories and apparel at the many stores that line the street. Vegetable and flower vendors sell their fresh wares right on the street.